Ringling Road is an east-west road which curves from Country Club Road back up to Lake Avenue. There are less than one dozen houses that claim a Ringling Road address; but those houses range from a small, stone cottage to large, imposing mansions. It is no mistake that Ringling Road provides the northern boundary for the Dole Mansion property. The road was named after Eliza “Lou” Ringling, who was instrumental in turning the Dole Mansion into the Crystal Lake Country Club in 1922. Mrs. Ringling, and her group of investors, created the Lake Development Company, which subdivided much of the large Dole estate into what is known as the Country Club Additions subdivision. Eliza “Lou” Ringling was the widow of the oldest Ringling Brother, of circus fame. Albert Charles Ringling, was born in Chicago on December 13, 1852, to August and Salome (Juliar) Ringling. The family moved to Milwaukee in 1853 and later to Baraboo in 1855. From there they moved to McGregor, Iowa. While in McGregor, Albert met a young widow, Eliza Morris. Albert shared his dreams of the entertainment world with her, she listened, and together they collaborated and turned their dreams into a success with the help of his brothers. On December 19, 1883, Albert Ringling married Eliza Morris. 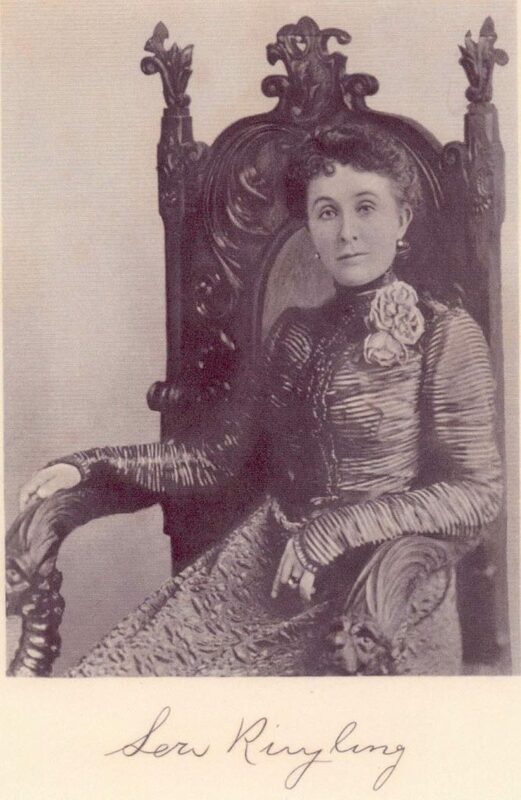 Albert Ringling’s wife, known as “Lou,” was named Eliza Morris at birth. She was born on May 12, 1851 at Morris Crossroads in Fayette County, Pennsylvania to John and Christina (Lyons) Morris. Early in her life the family moved to northeastern Iowa. In 1863, John Morris purchased property with a hotel in McGregor, Iowa. The hotel was then known as the Morris Hotel. Mrs. Ringling lived a colorful life. Albert, her husband, credited her for much of his great showmanship ability for the success of the small circus that became the Ringling Brothers and Barnum and Bailey Combined Shows, “The Greatest Show on Earth.” When the show was in its infancy, Lou performed many duties, including working the side shows as a snake charmer, riding horses, doubling in a mind reading act, performing on the high trapeze, participating in the parades, and for ten years having complete charge of the wardrobes. After retiring from the circus, the couple lived a quiet life in Baraboo, Wisconsin. At this time they worked on the development of a resort at Mirror Lake and built the $100,000 Al Ringling Theater as a memorial for the Baraboo community. Albert Ringling died on January 1, 1916. Mr. Ringling willed $325,000 to Mrs. Ringling along with furniture and property. The property included a large brownstone mansion in Baraboo, which later became the Elks Club. In 1922, Mrs. Ringling and a group of investors, known as the Lake Development Company, purchased the Dole Mansion property (then known as the “Consumers Farm”). The transaction involved nearly a half million dollars and was one of the largest real restate deals handled in the area. Under Mrs. Ringling’s guidance, the Dole Mansion was completely renovated and became home to the Crystal Lake Country Club. Just like several other large investments of Mrs. Ringling, the Crystal Lake Country Club eventually faltered. On October 14, 1941, Lou Ringling died at her home in Baraboo after a long illness. The estimated value of her estate was $6,500.